Las Mercedes, Venezuela turns out to support President Juan Guaido. 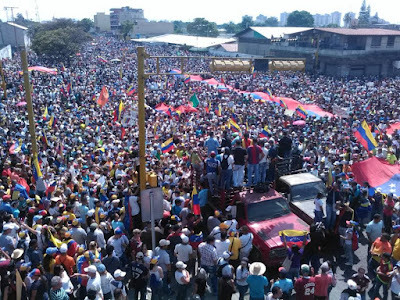 "Something astonishing happened this Saturday: protests not only overflowed Caracas and other large cities that have long been opposition bastions, like Maracaibo or Valencia; they expanded to small cities and towns, many of which used to be chavista strongholds. Nothing ever moved people in San Carlos or Altagracia de Orituco against the regime, but now, hit the hardest by the crisis, they’ve also joined mass anti-Maduro demonstrations. Hoy #2Feb los venezolanos nos expresamos con fuerza, dentro y fuera de nuestras fronteras. No cabe duda de que el usurpador está muy solo. 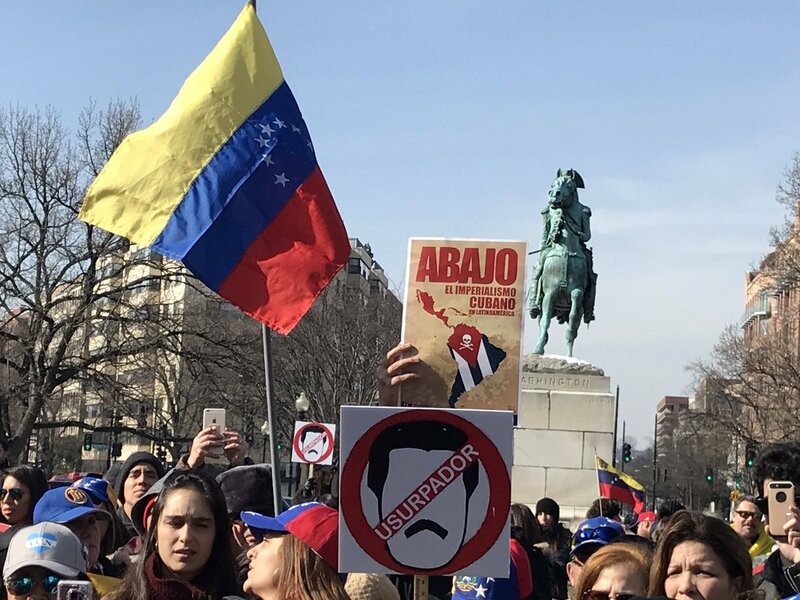 While chavismo only managed to stage a single event in downtown Caracas, an event characterized by the usual state companies with attendance lists, the call made by caretaker President Juan Guaidó mobilized large numbers of citizens in at least 36 confirmed locations all over the country. Moreover, reports of repression aside from short-lived clashes in Caracas are non-existent." 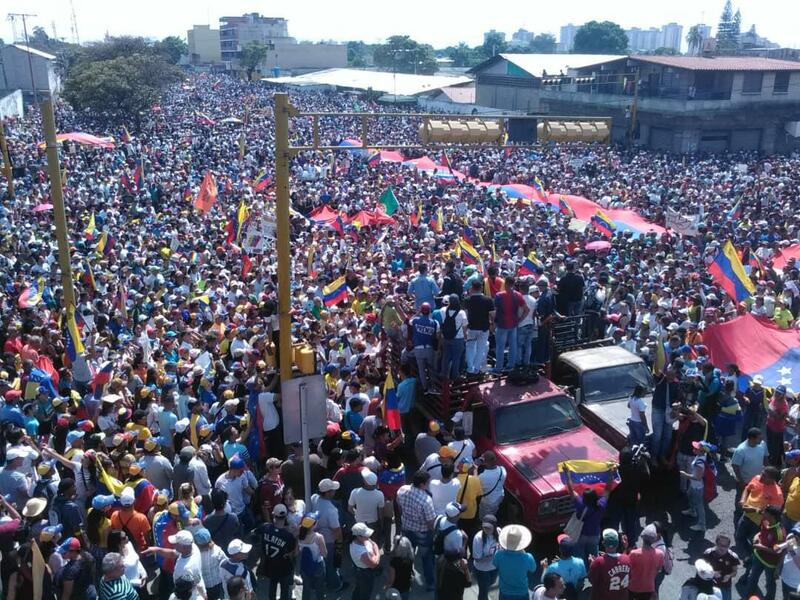 Barquisimeto, Venezuela turns out to support President Juan Guaido. 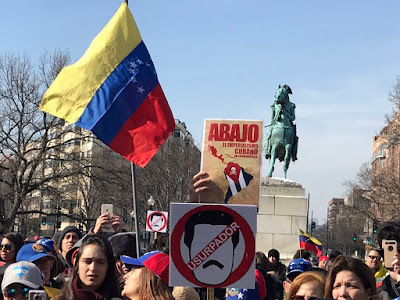 In Washington, DC at Washington Square Venezuelans gathered in support of a free Venezuela, and Venezelan President Juan Guaido. They also spoke out about how Maduro was an usurper who had violated the Constitution when his party lost the National Assembly. Yours truly was out there with a poster that translated to English read "Down with Cuban Imperialism in Latin America." The Castro regime has colonized and exploited Venezuela, Nicaragua, and Bolivia. Their totalitarian model once installed is difficult to remove, but hopefully today we are witnessing, after 20 years of struggle the beginning of the end of the suffering of the Venezuelan people and a new dawn of freedom.